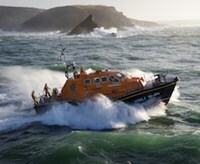 An RNLI Forever by the Sea Tribute Fund is a positive and powerful way to honour the life of someone special. By setting up a fund in the name of your loved one, you can turn treasured memories into practical support for courageous volunteer lifeboat crews. With an online tribute fund, you can invite friends and family to upload photos and videos, leave poems or messages of remembrance and light virtual candles to mark special dates or anniversaries. If you like, you can also set up fundraising events and sponsored activities in memory of your loved one. In 2016, our lifeboat teams rescued 8,643 people and saved 431 lives. They launched 8,851 times, braved the toughest conditions and darkest nights. But they couldn’t have done a thing without the charitable donations we receive. Thanks to your generous support, our lifesavers have the training, equipment and kit they need to continue saving lives at sea – and that is a wonderful, timeless tribute to your loved one.